Bar 8 in the Main Stand. Heading to the ground? Check out our variety of fan bars open before the match and at half-time. The ever-popular Bar 8 is located in the Main Stand next to the Wiseman Suite. With an outside area, it’s the perfect place to relax ahead of the big game with your pre-match pint. The bar is a tribute to Blues’ famous number 8 Trevor Francis and pictures of him and his iconic moments surround the the bar. For supporters sitting in the Gil Merrick and Main stands, Bar 8 is the ideal place for a quick drink before heading in to the big game. 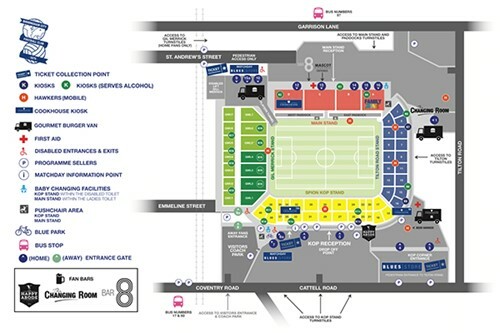 Bar 8 opens at 12.30pm for 3pm kick-offs and 5.30pm for 7.45pm kick-offs so check it out next time you are at the ground. The Happy Abode is our newest bar and was set-up after consultation with fans. Supporters in the Kop wanted somewhere to have a drink before heading through the turnstiles. First opened in September 2016, The Happy Abode features artwork celebrating Keep Right On, from which the bar takes it’s name. The bar is located to the right of entrance 5 of the Kop and replaced the previous Subway unit and Blues museum. The bar opens at 12.30pm for 3pm kick-offs and 5.30pm for 7.45pm kick-offs and you can enjoy a range of beers and soft drinks coupled with a lively pre-match atmosphere. If you’re sitting in the Tilton, the Changing Room bar is the perfect place to enjoy a pre-match drink. Located next to entrance 3, the Bar sits under the stand meaning it’s just a short walk to your seat. The Bar opens once the turnstiles are open and we recommend any supporter to visit this hidden gem. For supporters sitting in the Paddocks, D-Club Bar & Cookhouse is the best place for you. As the oldest remaining bar in the Stadium, D-Club has housed drinkers for decades. And that means there’s been plenty of stories told inside those four walls. The D-Club is open once the turnstiles are in operation meaning you can beat the kick-off rush!